You might remember my post from a few weeks ago where I embarked on the Grain Brain Challenge. I can’t believe it has been four weeks already. But here I am with my thoughts and confessions. Let’s start out with a little recap. 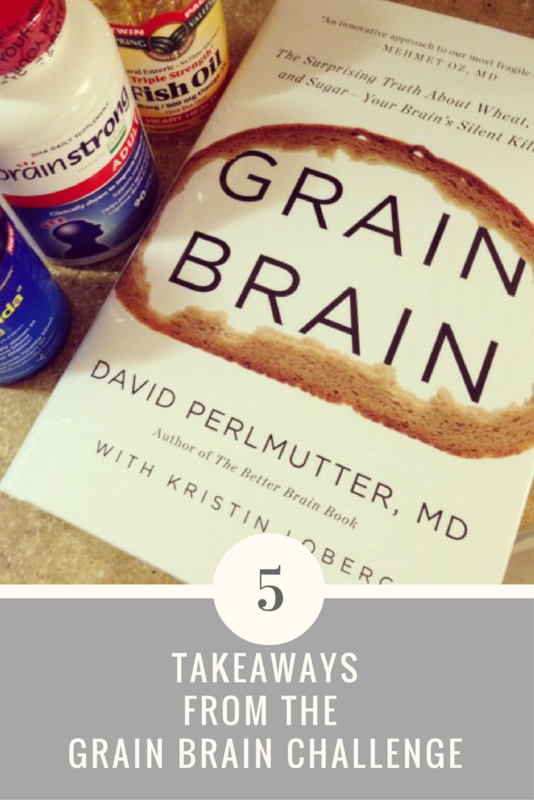 Grain Brain is a book by Dr. David Perlmutter that makes a pretty convincing case for eliminating wheat and gluten from one’s diet. It’s not simply for weight loss. In fact, the author makes a clear point that brain health is the main benefit of eliminating foods with these triggers that can produce inflammation in our brains that can lead to a host of health issues down the line. Grain Brain also encourages a variety of daily supplements be added to one’s routine like DHA, ResVida, and Vitamin D along with a healthy amount of sleep and exercise. After reading the book, I am sold on the idea that cutting gluten in wheat will only produce positive results for me. My challenge is making it happen. I was not very successful in my attempts to completely eliminate these foods from my diet. Obstacles I faced were busy schedules, other family members, and the Holidays. Yes, I admit that starting a challenge like this between Halloween and Thanksgiving was probably not the wisest thing for me to do. I suppose it was also a lesson in knowing my limits. I will say that meal planning helps a TON when trying to change eating habits. I found my biggest challenge to be dinner time when I was already cooking for my family and trying to eat differently for myself. Sleep is an area where I did a little better. I have been trying to get to bed at a reasonable time and find that getting up earlier makes for a more productive day. I am still a work in progress, but I know that sleep is valuable and I am working to protect my nights! I ran my first half marathon last month and this month I did a 10k so I have been pretty steady with the exercise. However, I have slowed down quite a bit and I need to ramp up my training again as I prepare for another Half in February! Of all the components of this challenge, I found the most beneficial to be the supplements. I definitely noticed a difference when I began taking the recommended supplements in the book along with my daily multivitamin. That is something I know I can and want to continue! At first it seemed like an awful lot of little (and some big) pills. But the benefits for me in the way I felt and thought definitely made it worthwhile. I am definitely hoping to drastically reduce the amount of wheat and gluten I consume. I don’t think I will ever eliminate it 100% but I am ok with that. What I have learned from this challenge is that taking steps toward good health is what matters. Every step in the right direction will be beneficial. Thanks for walking with me through this! Have you read Grain Brain or taken the challenge? I’d love to know your thoughts! Disclosure: This post is sponsored by FitFluential LLC on behalf of Grain brain. All opinions are my own.